I would like to introduce version 2.0 of the Champagne & Limousines font family, the latest results from my "experiments in digital type." Version 2.0 making it's debut March 5, 2010 includes new characters, new kerning and a few cosmetic changes to some characters to the font. Donations for the license to use these fonts commercially can be placed via PayPal using any major credit card, and do not require a PayPal account. Click here if you would like to donate. Email me nymphont@yahoo.com if you have any questions or need any assistance. I'd really like to congratulate you for this great font ! I use Century Gothic on a regular basis at work, because I find it a good compromise between serious and fun. In Champagne & Limousines, rounded letters (abcdeghmnopq) are much "higher" than the other ones (and that contributes to the originality of the font). For use in corporate documents, could you envisage to make a derivated font ("Coffee & Cabs" ! ), that would look more "strict" with all characters having the same height (or near, to keep some style) ? Century Gothic would then have a great challenger for professional use (that might be even more readable than CG when used for plain text, and not only for titles or short sentences). Thank you, I have been considering making a "serious" version of this font as I have used it enough now that I see what could be improved upon. And yes I am aware of the donate link situation, will fix asap! Thanks again, glad you like the font. I like this font quite a lot. I must say I'm with Francis about the possibility of having a "serious" version of the font with some of the characters, like the 'm', being shorter. I also wanted to make commercial use of the font, but the Paypal donation link takes me to Paypal's main page. Hi! My name is Nicole and for my typography class I've chosen your font Champagne and Limousines for a project. Basically we'll be creating a graphic poster advertising the font, by discussing its history, etc. I've looked over your blog and gotten some good information but I was wondering if you could tell me any more about it: why you decided to make it, what you like about it, where the inspiration came from, where it's been used, etc. I love this font so much and I'm very excited about this project, if you could help me out at all I'd really appreciate it, thanks! hi! I would love to use this font (commercially, on some websites, of course I will follow the licence agrrement :-)), but I somehow can't make some characters working.. For example "č" (Latin Small Letter C with caron, U+010D in unicode). Do I have something wrong on mi side, or are some unicode characters missing in this font? Is there some list of all characters included somewhere? You're very talented. I like 'Champagne and Limousines' and 'Caviar Dreams.' But are they based on some font from the 1930s? It seems like that 'look' originated around that time. 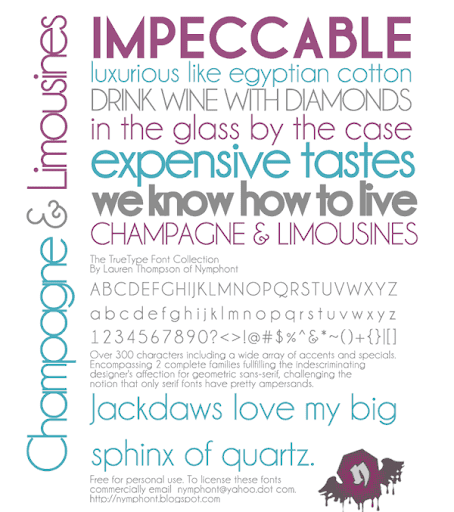 How much cost the commercial use (font embedding on a website) for the font champagne & limousine ? first of all - big fan of the font & donated, but for the life of me I cannot get the font to show on my Wordpress self-hosted site! I've tried the @font-family CSS property....using the Cufon font plugin and everything - any advice? Dear Lauren Thompson, my name is Sara Lecca, I'm a designer. I want to use one of your fonts commercially so, i've read, I have to buy the additional license with a PayPal donation. Let me know how much it cost. I'm going to use your beautiful font for the logo of my personal project. I'll wait your answer! Best regards, S.